It is not known when exactly Susruta lived. Several writers have dated him to 400 BC. His fame rests on the famous compilation of Susruta-samhita (The Collection of Susruta). This work is mainly devoted to surgery but it also includes medicine, pathology, anatomy, midwifery, biology, ophthalmology, hygiene, and psychology. Susruta attempted to systematically arrange experiences of older surgeons and collect scattered facts about medicine into a workable series of lectures and manuscripts. 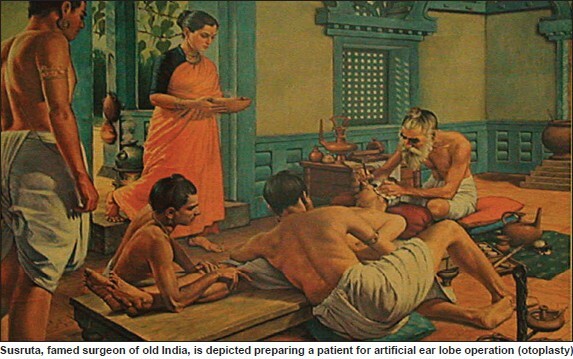 India has one of the world's oldest medical systems. It is known as Ayurvedic medicine (Ayurveda). Ayur in Sanskrit means"life" and veda means "science" or "knowledge"; thus ayurveda is the science of life. It has evolved in India over thousands of years. In modern times, ayurveda is considered Complementary Alternative Medicine (CAM): Herbs and specialized diets. Ayurvedic medicine integrates the balance of the body, mind, and spirit. It is based on theories of health and illness and on ways to prevent and promote wellness, and manage or treat health problems. As with Babylonian, Egyptian, Greek, Arabic, and Western medicine, the beginnings of Hindu medicine has its roots in magic and superstition and it developed through the centuries. As in other primitive societies, early Indian society punished wrongdoers with physical mutilation. Cutting off the nose was the usual punishment for adultery. Susruta is believed to have developed the technique of nose restorations and Indian doctors became highly skilled in nose restorations (rhinoplasty). The technique is widely practiced by plastic surgeons today and is widely known as the "nose job." Nowadays, many people have rhinoplasty in order to conform to contemporary ideals of beauty. "Indian Medicine has played in Asia the same role as Greek Medicine in the west, for it has spread in Indo-China, Indonesia, Tibet, Central Asia, and as far as Japan, exactly as Greek Medicine has done in Europe and the Arab countries..."
Hindu medicine is closely related to religion; and hence it tended to remain static, unlike Greek medicine, which developed through a completely secular approach, and had greater influence on the world.